1. Rose’s Luxury. My very favorite restaurant in DC. I never hesitate when I’m asked this question. It’s a restaurant that astonishes in its ability to be fabulous on one visit, and more fabulous the next. The menu changes frequently, so each visit is unique. But there are sure to be a few favorites on the menu such as the pork sausage, habanero and lychee salad- which is also available in a vegetarian version. I’m fairly certain there would be a rebellion if this dish went away. Rose’s Luxury and chef/owner Aaron Silverman gained widespread national attention in 2014, when Bon Appetit named it the #1 Best New Restaurant. The acclaim continues with the restaurant’s inclusion on “The National Eater 38: Where to Eat in 2015,” and mentions on everyone’s DC favorites list. This is not making it easier to get into the no-reservations spot. I’ve twice left my office at 3:30 pm to head here for dinner…and I can’t wait to do it again. 2. Kapnos. Chef George Pagonis has followed in partner Mike Isabella’s footsteps by competing on “Top Chef.” He was eliminated in the first twenty minutes, made a comeback, and is currently in the final four. Yes, I am attracted by the “Top Chef” thing. But the food at Kapnos is the real star. The wood roasted mezze, the spreads (including tyrokafteri, taramosalata, and revithosalata), and the phyllo pies are highlights. 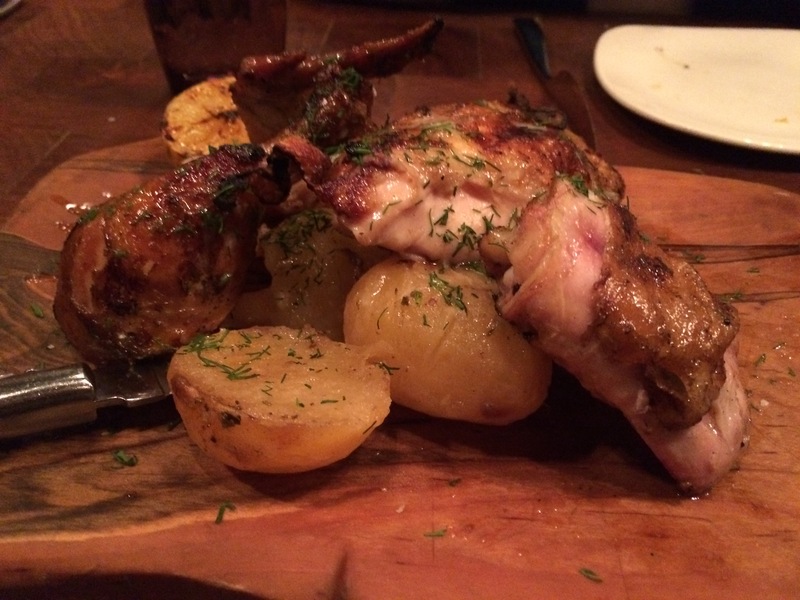 On my last visit I swooned over spit-roasted chicken with lemon potatoes. The team is opening Kapnos Taverna in Arlington in the very near future. I jumped for joy when I learned they will also open Kapnos Kouzina in Bethesda this summer. 3. Crane and Turtle. This tiny spot in Petworth made it on many lists of favorite newcomers in 2014. I’ve been three times, and am raring to return. The menu changes to reflect seasonal ingredients, but recent favorites include charcoal grilled quail, scallops, and hamachi tataki. There’s a dedicated team cooking here, led by Chef Makoto Hamamura. He recently took his chefs on a field trip to Japan. I can’t wait to taste the results! 5. City Perch. While Tom Sietsema gave this newcomer a one star review, I think the Rockville restaurant has great potential for Montgomery County residents who are looking for food that is a cut above standard fare. I’ve already dined here for happy hour, lunch, and dinner, and plan to return soon. They say that man shall not live by bread alone. 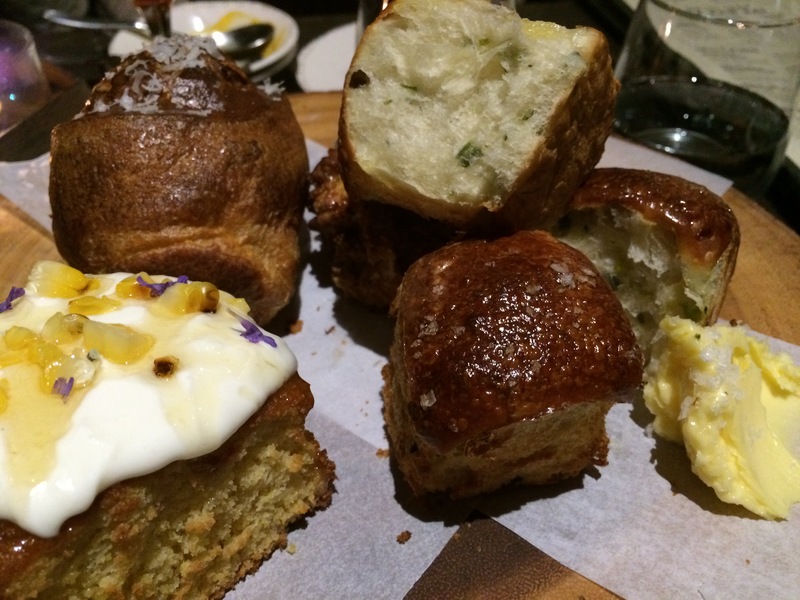 The City Perch bread board may encourage you to try. And in case you missed my most recent post, the flavors of Ocopa are still on my mind. I foresee another visit in the very near future. My current restaurant to do list includes exciting newcomers like Thip Khao (Laotian cuisine), Mango Tree (Thai cuisine from restaurateur Richard Sandoval), Bul (Korean comfort food), and China Chilcano (Peruvian fusion from Chef José Andrés). I also cannot wait for Peter Chang Cafe to open in Rockville next month, and then there’s Centrolina from Chef Amy Brandwein and Convivial from Chef Cedric Maupillier. Where are you looking forward to dining in 2015?